I apopogize for the lack of posting on my end. Between the longest chest cold known to man, exams, starting a MA and transcontnentail travel I have been doiong the bare minimum to keep us from staving to death, and a lot of take out. I am back…cooking and posting. Which is good because this recipe is extremly time consuming. I love sarma, sometimes called dolma. 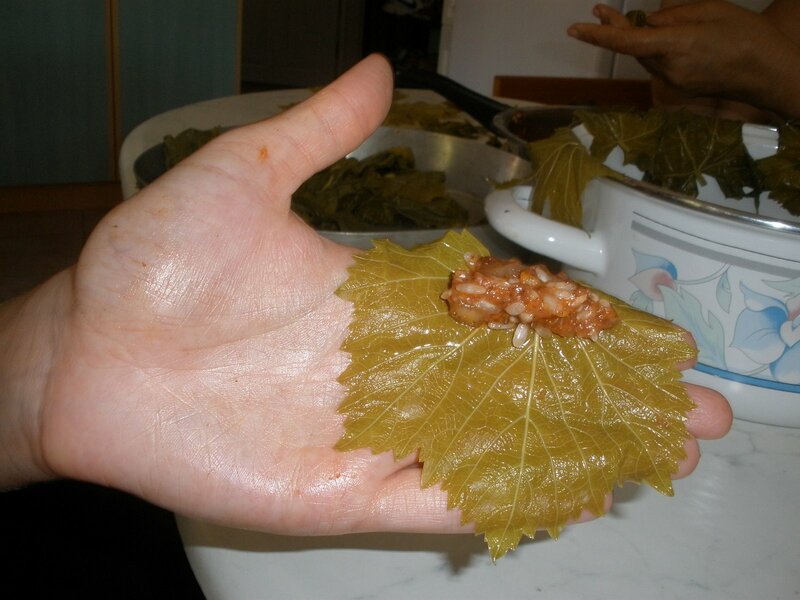 Grape leaves stuffed with rice and beef, served with yogurt on top. It is worth every minute. If you can’t find fresh, brined will do. Take all of the ingredients above and combine, except the grapeleaves and the lemon. Mix thoroughly. The seasoning will be most evenly distributed if you knead it with your hands. Set the mixture aside. Wash the leaves, then place them in a boiling pot of water for 5 minutes, until tender, but not too soft. If the leaves were brined soak them in cool water and rinse before use. Firmly squeeze out any water, but be careful not to rip the leaves. 2. Now the left corner. 5. Now the tricky part. Using your thumb to keep the roll tight, start rolling the filling down towards the bottom of the leaf. Now, go make a hundred more. Make sure not to stuff them too much or when the rice expands during cooking it will burst the grape leaf. 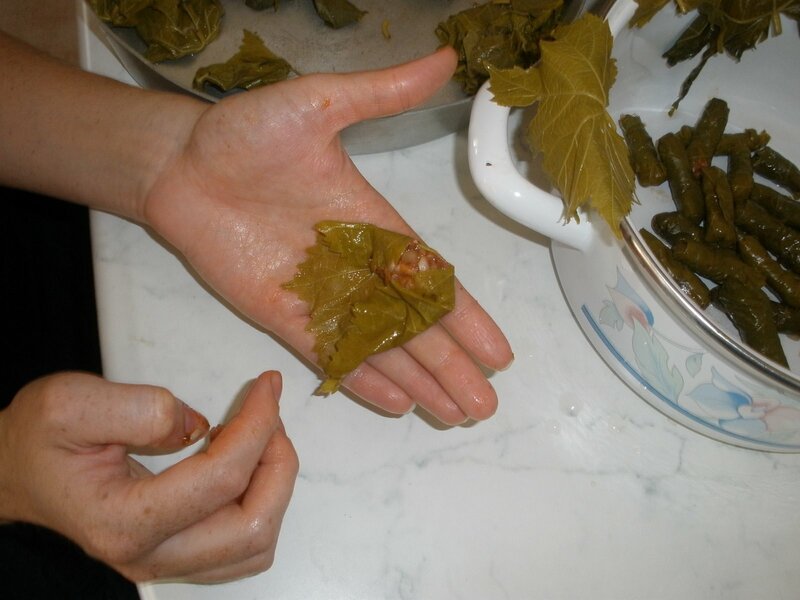 When you are finished, take a heavy bottomed pot with a lid, cover the bottom with grape leaves(the ones that ripped or seemed tough), then carefully place your sarmas inside, seam side down, close together but not tightly packed. Place them in concentric circles leaving the middle of the pot open. Add enough water to cover the sarmas (I used the water I cooked the grape leaves in, because it has all the nutrients from the grape leaves.) Juice the lemon and add it to the water. Cook on the stovetop on a low heat, for about an hour, until the rice is done. At 50 minutes, check on the rice, if it is not done, give it another 10 minutes or so. When serving, it is great with yogurt on top. I love to add mashed garlic to my yogurt, and then spoon it on top. How exciting! (The recipe, not the cold!) This is my mom and her boyfriend's favorite Greek dish. I love it too! Yum! Imagine my surprise when I saw the word 'sarma' in your list of categories!! I have visited your site a few times, but never noticed that! My family is Slavic and we make Sarma, too! I've never heard of anyone who knows the word. We make ours a little differently, which I'm sure varies from family to family. Ours uses beef, lamb and veal and we wrap them in cabbage leaves. Our 'meatballs' are really big, too. About the size of a baseball, but formed into an egg shape. Ours is also in a tomato sauce with kraut. So, very different, but same name. Thanks for sharing this! It looks really tasty!